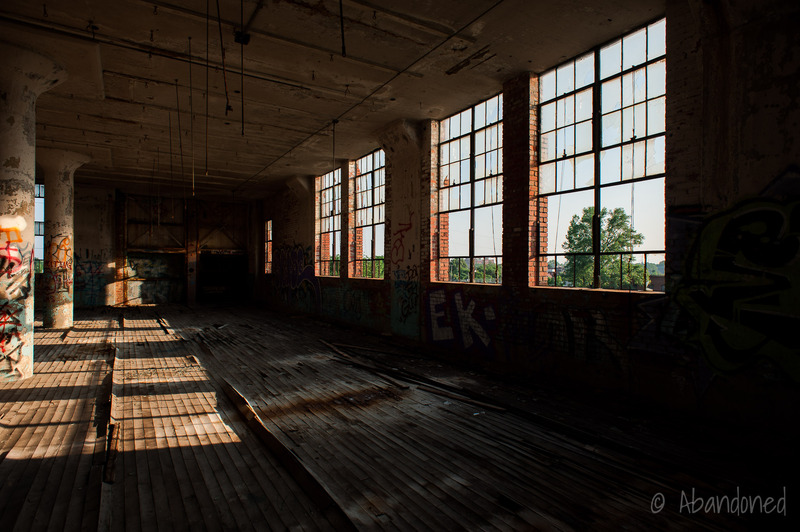 The Joseph & Feiss Company is a former manufacturer of tailored apparel for men in Cleveland, Ohio. The company changed hands as it grew larger: Koch & Levi in 1853, Koch, Levi & Mayer in 1855, Koch, Mayer & Goldsmith in 1867, Koch, Goldsmith & Company in 1871 and Goldsmith, Joseph, Feiss & Company in 1892. 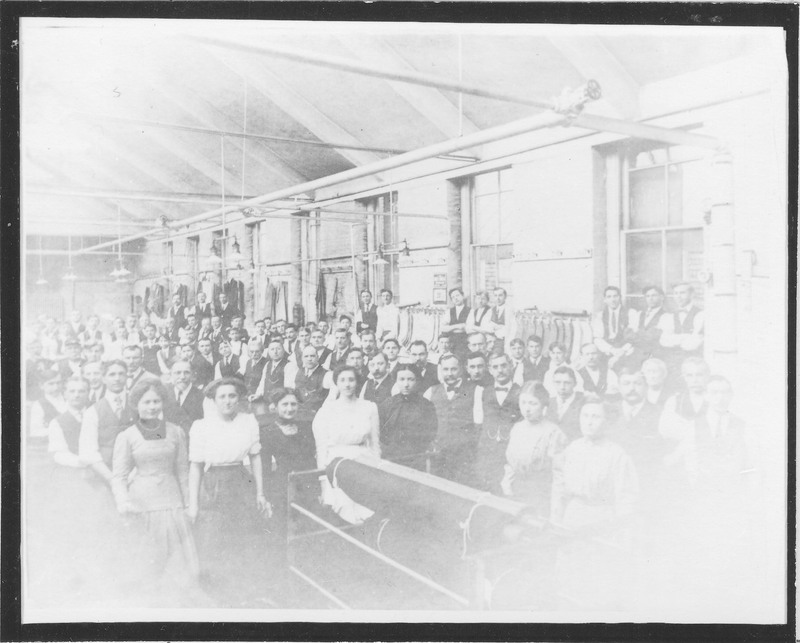 2 Moritz Joseph and Julius Feiss both joined the clothing company in the 1870’s. When Jacob Goldsmith retired in 1907, the firm adopted the name Joseph & Feiss Company. In 1897, Joseph & Feiss decided to internalize its manufacturing operations and the small outsourced operations were absorbed with their proprietors employed as foremen and operators. 1 2 4 9 The company began a small shop at 642-702 St. Clair Street and built a one-story shop building on Swiss (later renamed West 53rd) Street. 2 This was enlarged with a two-story structure in 1903 designed by Lehman & Schmitt to be incrementally expanded over time. 9 It featured neo-Medieval and Gothic Revival architectural features with interiors that resembled late 19th-century structures. The 1903 addition was expanded to the south a year later to form a U-shaped structure with room for stock, manufacturing and offices. Female garment workers c. 1907. Image by the Western Reserve Historical Society. 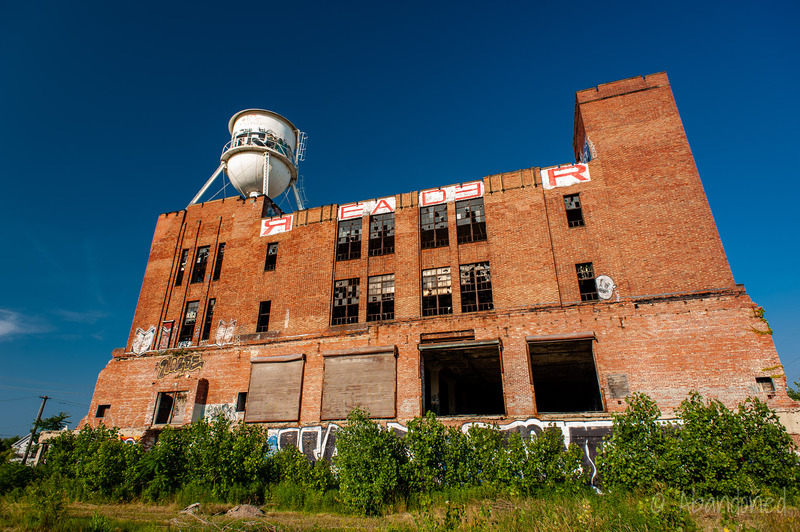 After much growth in sales, the company began acquiring residential lots to the east and north and in 1920-21 built what was dubbed the largest clothing factory in the nation. 9 The new seven-acre complex was designed by Lockwood, Greene & Company of Chicago, Illinois and constructed by Stone & Webster, Inc. of red brick and sandstone trim with Gothic Revival, Neo-Classical and Art Deco influences. 9 The main two-story building, with a saw-tooth roof with glass panels for lighting, measured 300-feet by 420-feet. 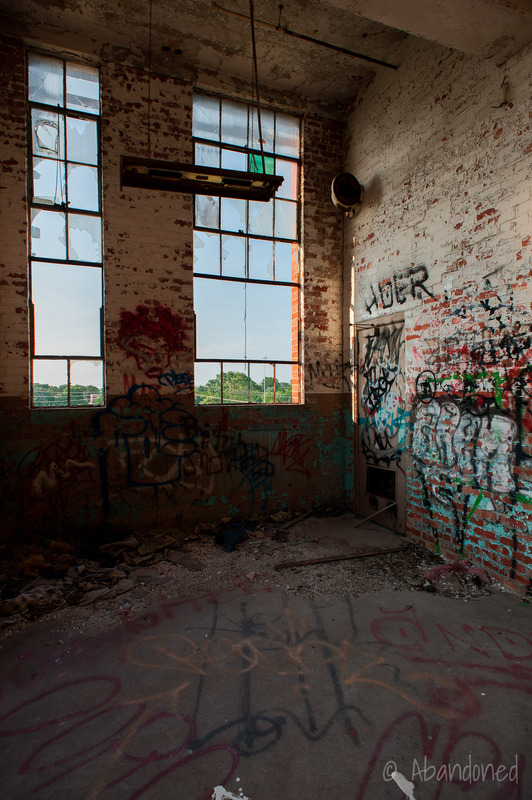 The lower floor housed the machine shop, box room, shipping and receiving departments, a kitchen, dining rooms, a 1,200-seat auditorium, swimming pool, handball court, checker and reading rooms, and locker rooms. 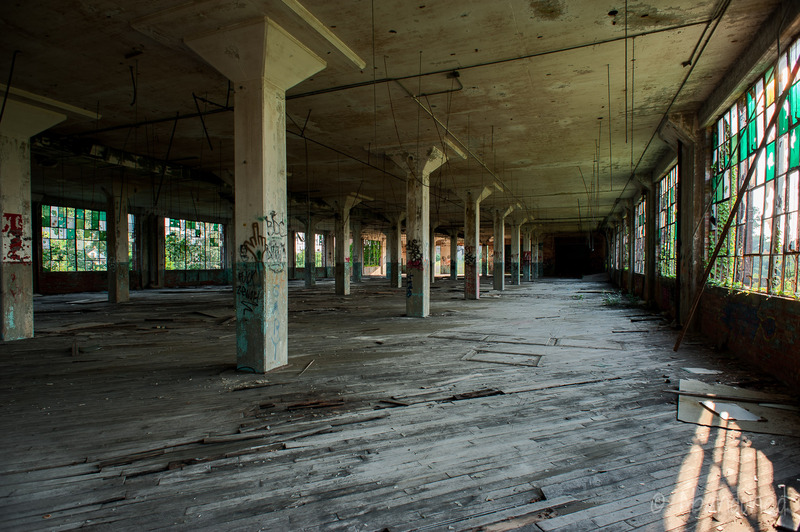 The upper floor housed the cutting, trimming, sewing and pressing departments. c. 1906. Image by the Western Reserve Historical Society. 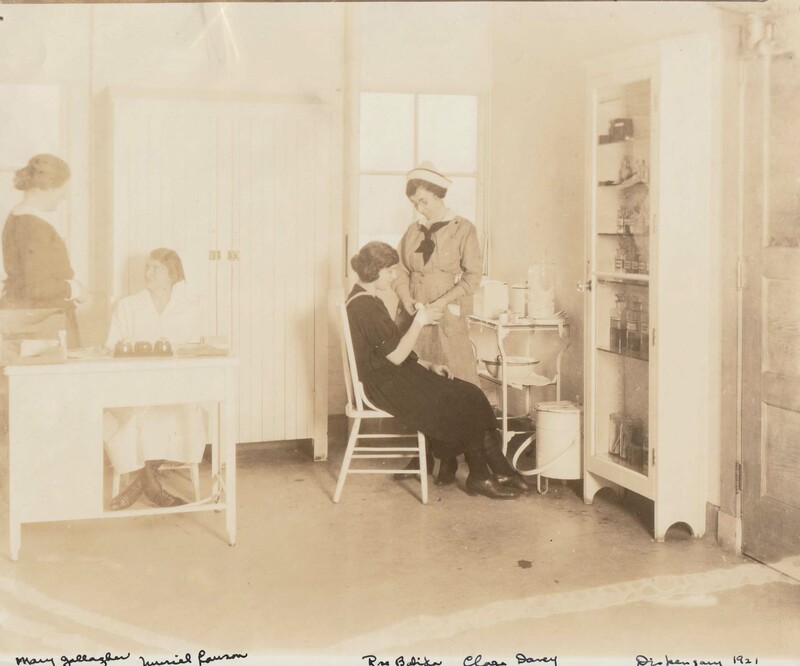 Infirmary at the new W. 53rd St. plant, c. 1920. Image by the Western Reserve Historical Society. A woman sewing c. 1920. Image by the Western Reserve Historical Society. 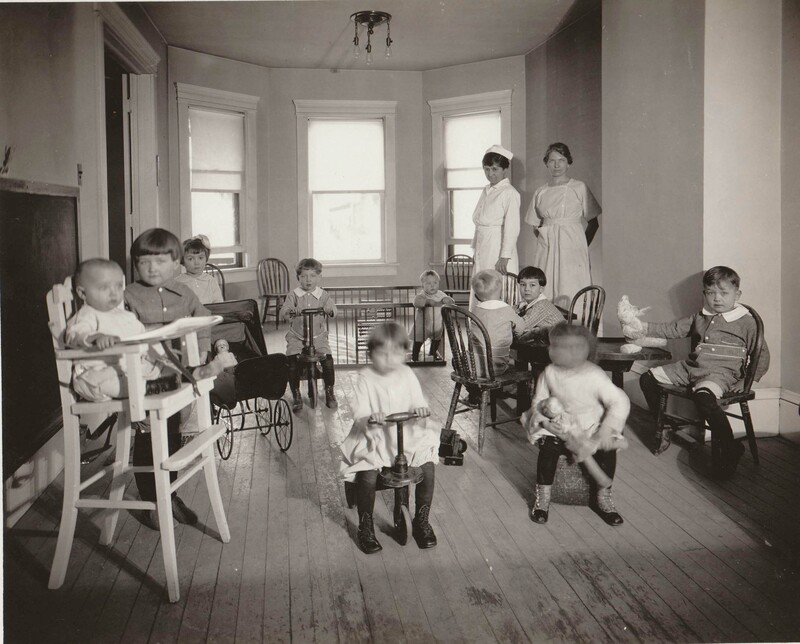 Nursery, c. 1920. Image by the Western Reserve Historical Society. 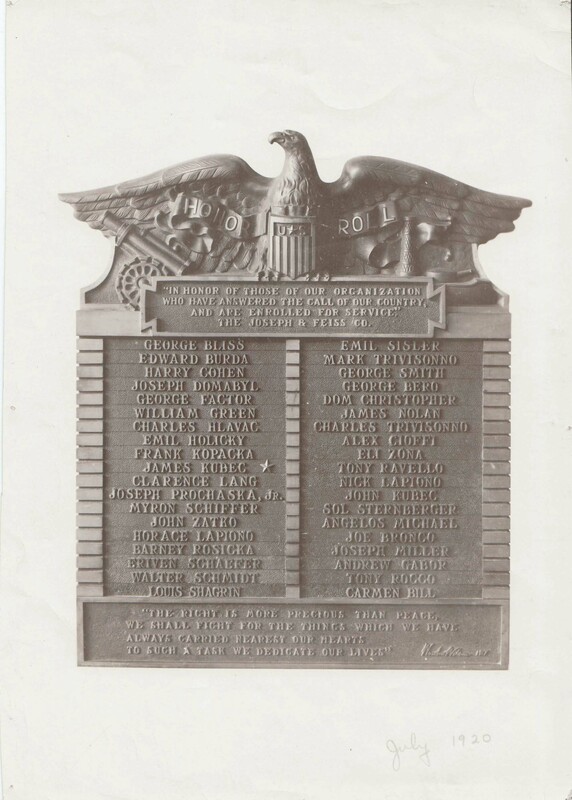 A plaque honoring employees who had served in the military, c. 1920. Image by the Western Reserve Historical Society. A man working with liquid adhesive in the material handling plant, c. 1930. Image by the Western Reserve Historical Society. 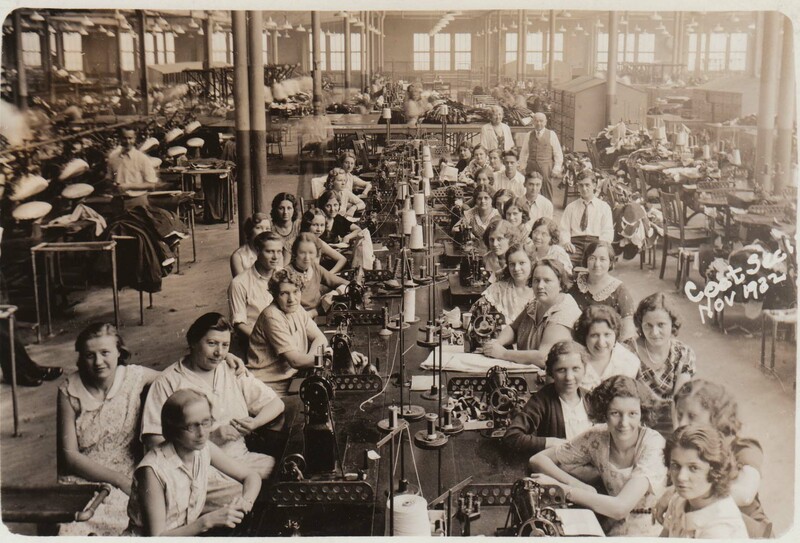 Workers in the coat section, November 1932. Image by the Western Reserve Historical Society. 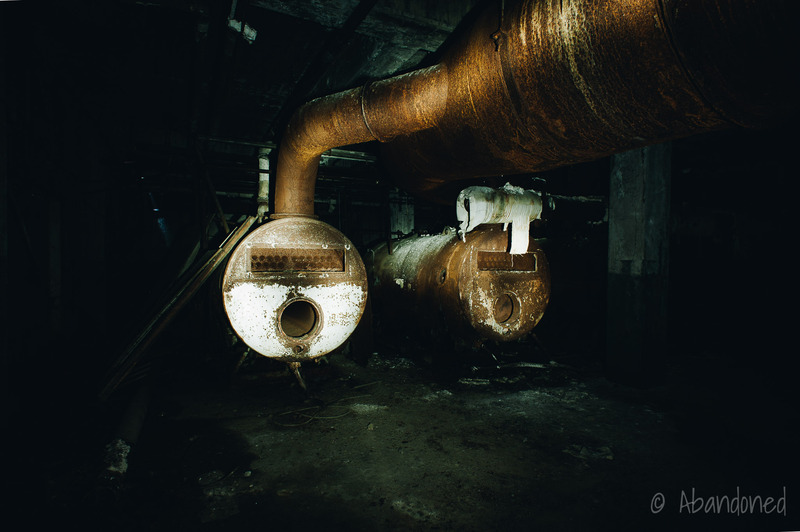 An adjacent four-story warehouse, measuring 80-feet by 200-feet, contained boilers in the basement, the designing and final examining departments, and a training school for new employees. 2 The top two floors were used for storage and packing of finished goods. 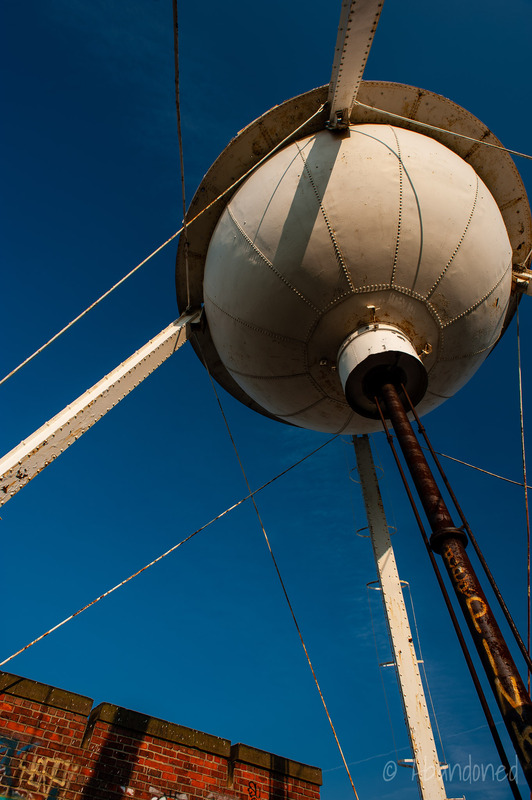 Atop the roof was 60,000-gallon water tank that was connected to the internal sprinkler system for fires. In 1926, the administration building was renovated and the north entrance was modified. 9 The original one-story administration building was razed, which was attached to the two-story addition. 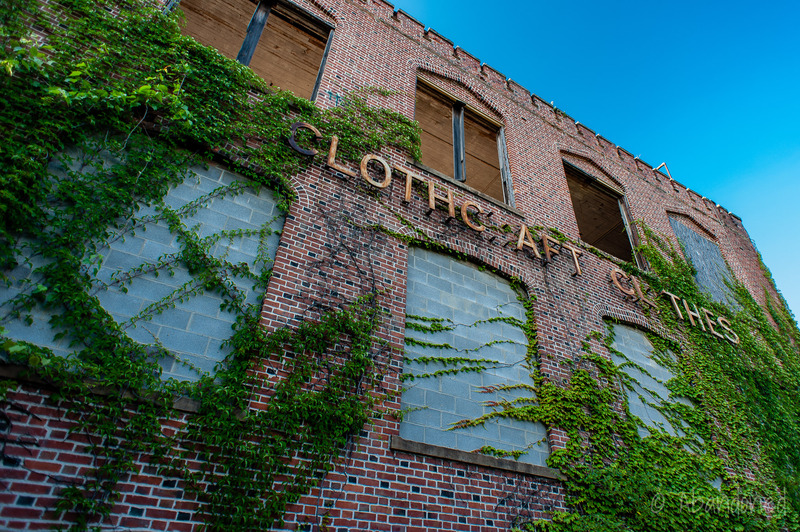 Lehman & Schmitt incorporated the existing window frames and one door frame from the original building into the courtyard facade. Windows from the first addition were also used a stairwell. The company operated under early 20th-century corporate paternalism, providing its workers with a decent wage in addition to recreation and health facilities, a library, excellent food, and classes in English and citizenship. 2 9 It was also one of the first to introduce the scientific management concepts of Frederick Winslow Taylor 2 due to the efforts of Richard A. Feiss, vice president, and Mary Barnett Gilson, a personal manager. 4 Together, they demonstrated that scientific management was appropriate to the labour-intensive production of suits. Combining Taylor’s industrial engineering techniques and contemporary welfare practices, Feiss and Gilson were able to anticipate trends in post-World War I years and challenged conventional ideas about the relationship between the employer and employee and specifically, the roles of women in the industry. 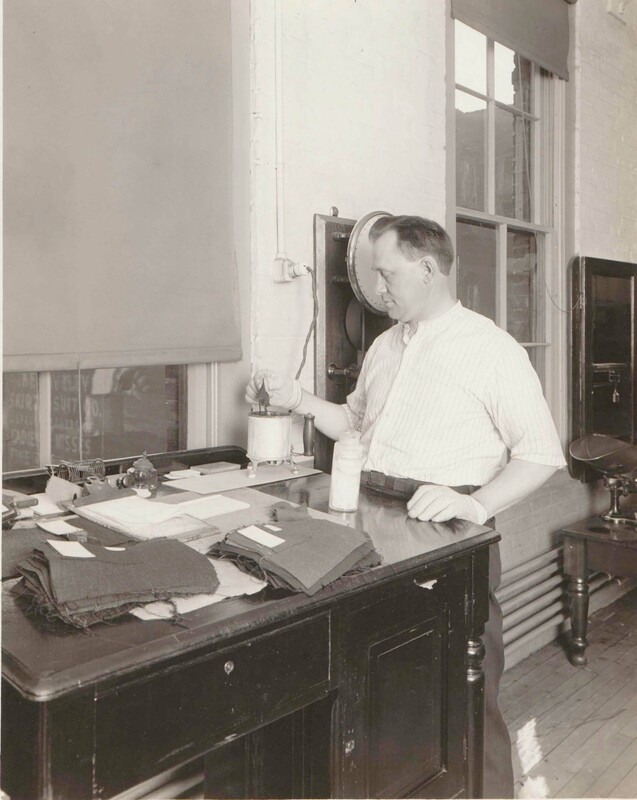 The turning point for Joseph & Feiss came in 1905 when Richard, the son of one of the company’s owners, became vice president in charge of organization and manufacturing. 4 Feiss had graduated from Havard University with a degree in law in 1901 but found the practice too routine. While residing in Boston, Feiss became interested in Taylor’s theories of scientific management, going as far as hanging a portrait of Taylor in his office and becoming president of the Taylor Society. 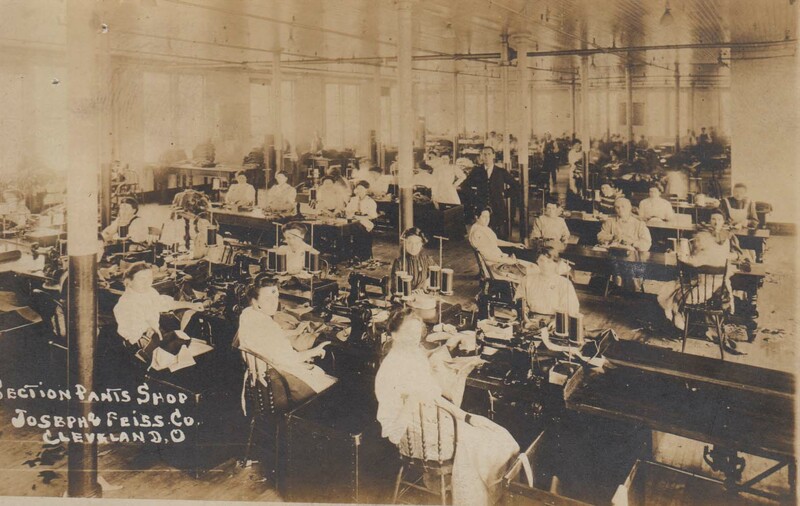 Early on, Joseph & Feiss adopted semi-automatic machinery that was driven by electric power and divided and subdivided production of its suits so that the production process included as many as 189 separate steps. 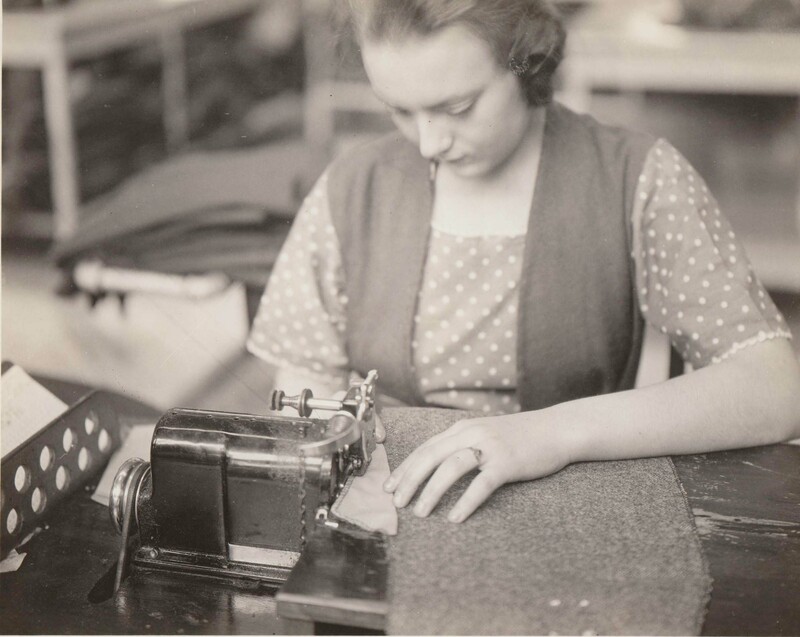 4 These repetitive tasks were often handled by female employees who completed only one step in the elongated process, such as sewing on pockets, collars and sleeves, while men cut and tailored. The scientific approach allowed the company to utilize high-volume production techniques for its standardized lineup. The process was reviewed four times a year for any readjustments. Operators of the machinery typically started at the lowest pay grade and were given opportunities to work their way up the production process. 4 Clerks kept detailed records of each employee, noting their earnings. To reduce turnover and absenteeism, the company developed six separate bonuses. A daily production bonus was paid to each operator who maintained their rate; a daily quality bonus was given who avoided rejections for defective workmanship; a daily attendance bonus of 50 cents per day was given to those who came to work on time; an excuse bonus was rewarded to those who explained their absence; a service bonus of five cents per day for every year of service; and an advanced notice bonus that encouraged employees to forewarn the company if they were going to leave. An orthopaedic surgeon designed new chairs for employees, and special tables were crafted to produce garments with as little motions as possible to expedite the process and the reduce fatigue and stress. 4 To reduce monotony, female operatives were allowed to get new batches of garments rather than have them delivered to their station. But with the expanded production meant some anger. In January 1909, skilled pressers went on strike to protest wage cuts that would reduce their earnings from 25% to 50% and fines that penalized workers for damages. 4 Many of the pressers were of Czech descent who was also torn with Feiss’ efforts to eliminate independent tailors, many of whom were of Czech descent. In addition, a book of 23 rules that were issued in early 1909 resulted in some flack, such as the elimination of timecards and the issuance of buttons. For those that were late, the employee would be forced to go into a supervisor’s office and explain their tardiness. The strike was ultimately defeated and many of those striking workers were eventually fired. 4 But in return, Feiss formed the Department of Employment and Service and invited Mary Gilson to head it in 1913. Gilson, with Feiss’ support, instituted or sponsored dances, picnics, societies, clubs, orchestras and athletic programs. Gilson also started systematic home visits and in-plant talks with women workers and their mothers to convince them to be more assertive with their families. She suggested that “foreign-born men” to share cooking tasks, convinced parents to allow their daughters to attend social dances and entertainment and told men to pack their own lunches. Gilson also advocated for a five-day work week and in 1919, Joseph & Feiss went to a five-day work week with 8½ hour days. Gilson and Feiss, however, frowned upon ostentation and berated workers for smoking, chewing gum, wearing makeup or flashing jewellery. 4 Shaken by their employee’s preference for “cheap dance halls and movies,” Gilson instituted a series of choral performances, entertainments and dances – all of which promptly ended at 9 pm. During lunch, employees sat at tables with assigned leaders who monitored conversations and forbade the use of foreign languages. After the strike of 1909, Joseph & Feiss remained free of labor unrest. 4 Between October 1922 and 1925, the company withstood well-funded efforts by the Amalgamated Clothing Workers of America (ACWA). An employee representation plan, a mean to present grievances, was established in 1919 that did much to resolve many issues, as did curbs on foremen and forewomen powers. 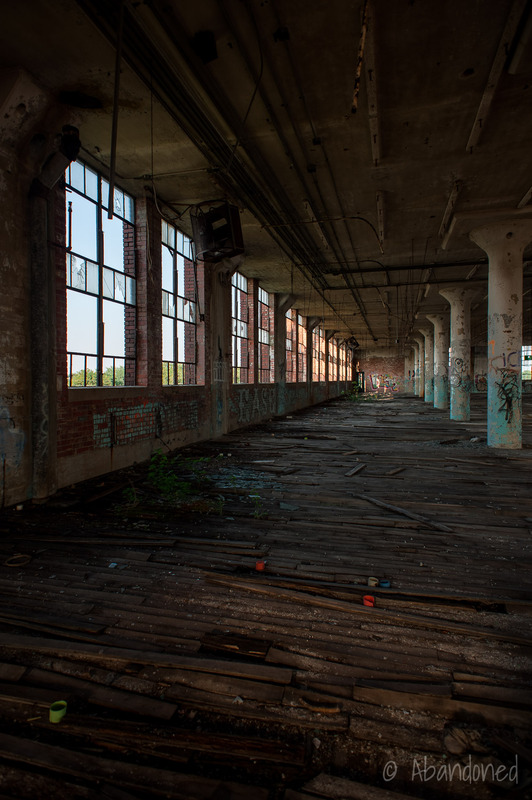 But a decline in sales post-Great Depression that coincided with the opening of a new factory building in 1920 led to a considerable financial burden on the company. Fashion tastes were also changing rapidly, and many customers began to purchase more streamlined suits and coats that Joseph & Feiss resisted. The plant, with a capacity of 750,000 suits per year, was only making 350,000 per year. The company net earnings dropped from $375,006 in 1923 to $138,422 a year later and it failed to pay its preferred dividend for the first time. Facing deep cuts in the Employment and Service Department, which some considered “frills,” Gilson resigned at the end of 1924. Feiss’ father and brother, both of whom held executive positions within the company, began to doubt the scientific management principles. 4 They began to question the high salaries paid to engineers and other scientific management experts that the company brought on. With the tide turning, Feiss resigned in mid-1925. By June 1926, many of the refinements made by Feiss were dropped. By 1926, however, Joseph & Feiss was on the upswing once again. In March 1934, the firm was unionized by the ACWA after 1,800 employees staged a brief strike. 1 The union and management negotiated a 10% wage increase for the workers. 53rd Street manufacturing plant in 1994. Image courtesy of Google Earth. After World War II, the Clothcraft label was replaced with a series of other branded specialities. 2 In 1957, Joseph & Feiss was acquired by the Samuel Spitz Company of Chicago, which came along with it the Cricketeer brand. Joseph & Feiss merged with Phillips-Van Heusen Corporation in 1966 but retained its identity and Cleveland operations, where it produced and sold tailored men’s apparel under the Cricketeer and Country Britches brand. 1 9 It added tailored clothes for women in 1980. 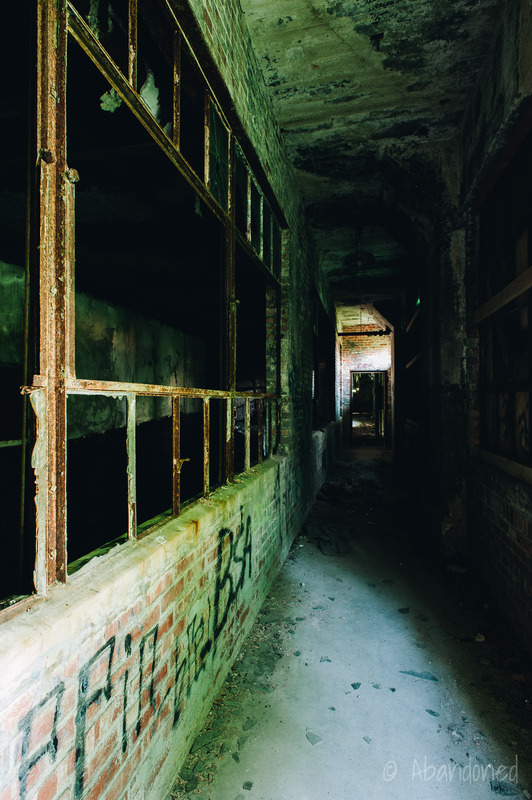 By 1986, the 53rd Street manufacturing plant housed the corporate offices, the design department and the jacket manufacturing units that employed 1,300 people. 2 Its distribution and warehousing operations moved to a new automated and computerized centre on Tiedeman Road. In 1989, Joseph & Feiss and its 46 apparel speciality stores were acquired by Hugo Boss AG, a West German clothing firm, for $150 million and were made a division of its subsidiary, International Fashions Apparel Corporation. 1 3 By 1995, the firm had 800 workers at its manufacturing plants on West 53rd Street and Tiedeman Road. The company also had an outlet store at its 53rd Street location. But with lower-priced imports, competition and a growing acceptance of casual clothing at the workplace, Joseph & Feiss announced that its Cricketeer and Country Britches labels would be discontinued and that 200 employees would be laid off. In addition, the company consolidated production at its Tiedeman Road facility. 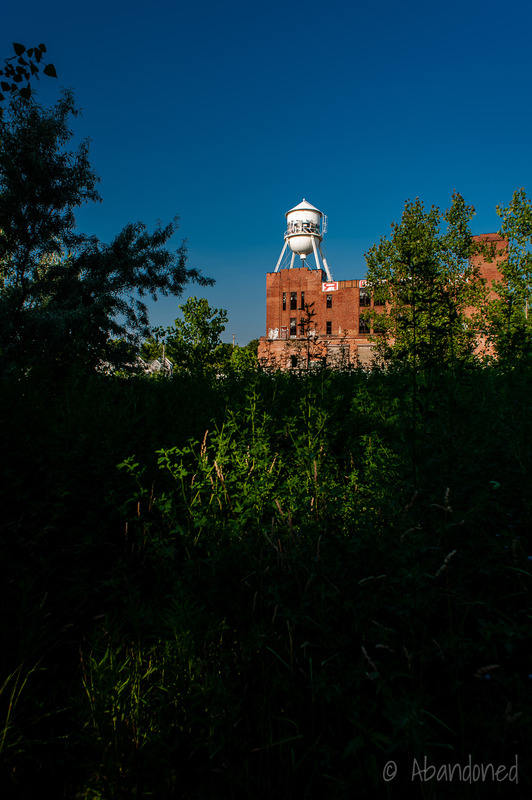 In 1998, 7 Ameri-Con Homes acquired the former Joseph & Feiss facility at 53rd Street and announced that the complex would be converted into 150 condominiums and townhomes for $20 million. 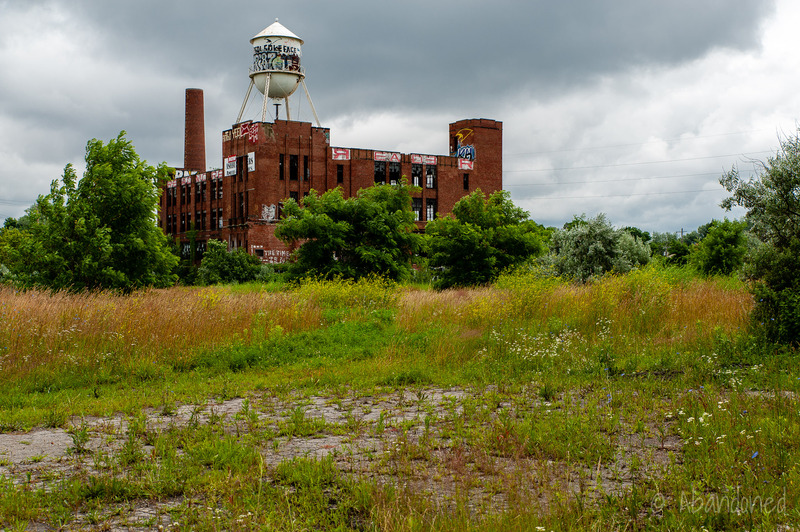 6 After being sidetracked for three years, the Planning Committee of the Cleveland City Council approved a measure in September 2002 to change the zoning of the property from industrial to residential. 8 The delay was attributed to former Mayor Mike White’s refusal to sign off on the design plans of the Joseph & Feiss project until another development project of Ameri-Con Homes was completed. That project involved 110 townhomes on Jennings Road in the Old Brooklyn neighbourhood which had temporarily stalled due to erosion. Overview map. Image courtesy of Process Creative Studios. A fire in 2006 destroyed the wood framework for six townhomes. 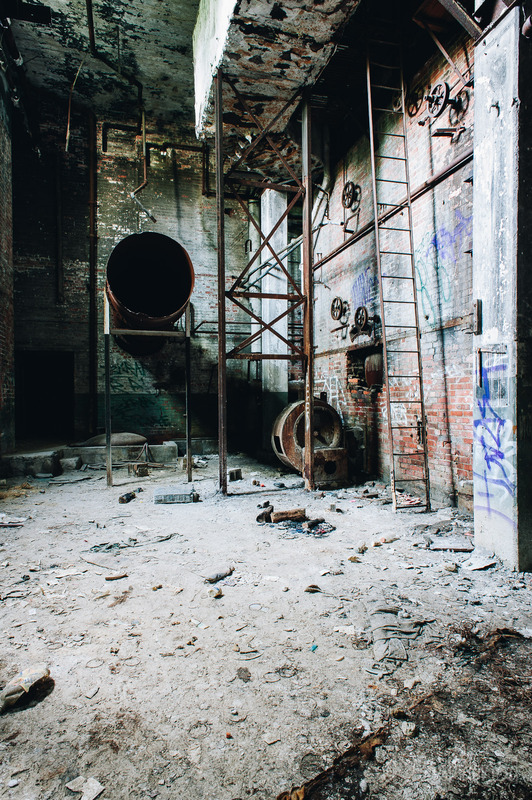 7 Citing the fire and a slow housing market, Ameri-Con abandoned the project. Huntington Bank, Ameri-Con’s lender, foreclosed. 6 The property failed to sell at a sheriff’s sale and was eventually split into two pieces and sold at a private auction. Developer Mark Strauss bid $375,000 for two six-unit buildings, one of which was finished and the other abandoned. 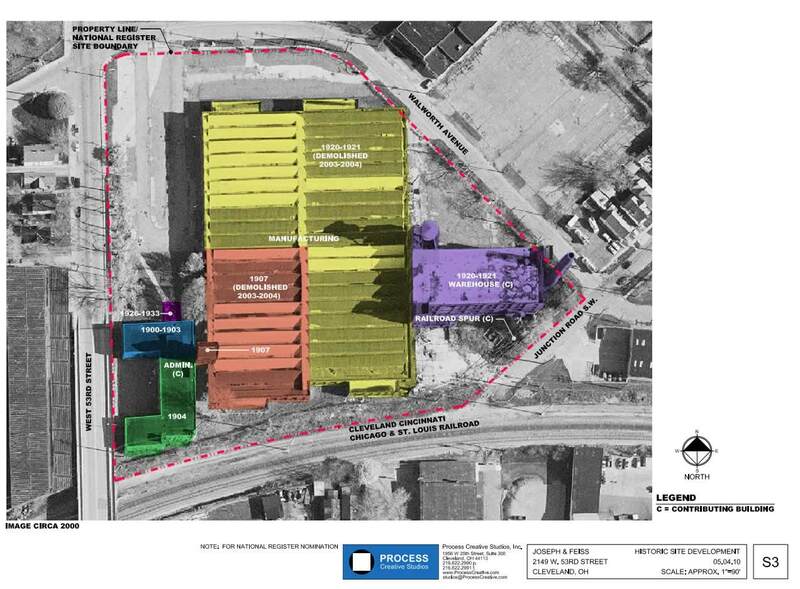 Another developer, Doug Perkowski of Urban Housing Limited, acquired the vacant factory for $255,000. Strauss’ project, Kierland Commons, which will consist of 26 townhomes in five to nine buildings, will cost $1.6 million. Work to rehabilitate the boarded units began in February 2010. 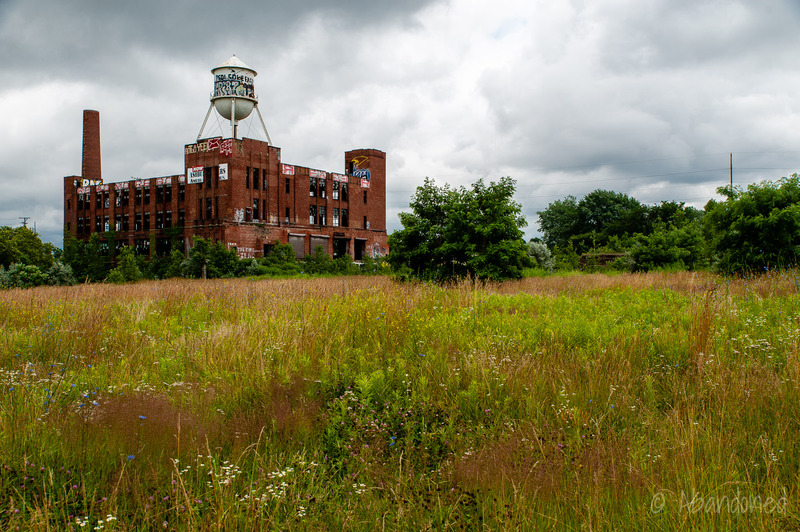 On July 28, 2011, the State of Ohio’s Department of Development awarded $1 million in Ohio Historic Preservation Tax Credits towards the renovation of the remaining Joseph & Feiss buildings. 5 The project, with an estimated cost of $9 million, sought to rehabilitate the structure into 62 market-rate apartments. In 2015, Menlo Park School, a charter school, acquired the former Joseph & Feiss property for $275,000. 10 It was then able to secure $17 million from state charter school expansion grants and several state and federal historic preservation tax credits, along with a conventional $6 million construction loan. One of the buildings on the campus was rehabilitated for the school’s 400 students and reopened in the fall of 2017. The school had relocated from a small space at the St. Mel Parish and classroom trailers in a parking lot. “Joseph & Feiss Co.” Encyclopedia of Cleveland History. N.p. : Case Western Reserve University, n.d. Web. 16 Mar. 2014. Article. 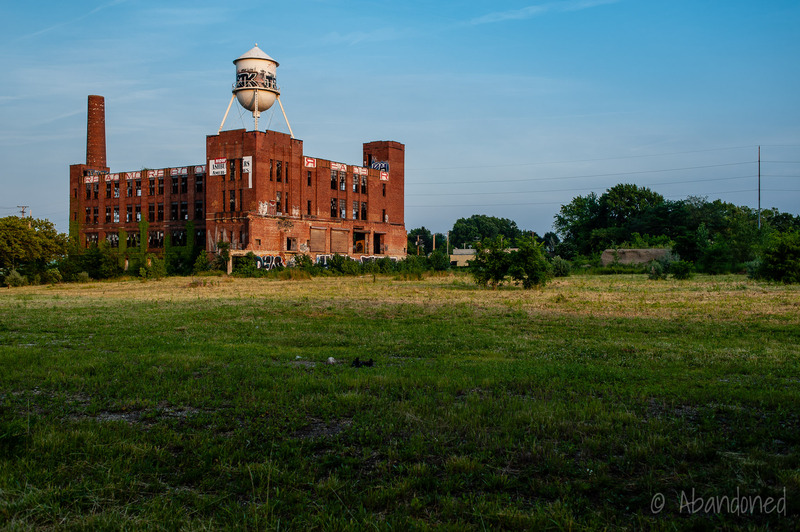 Society for Industrial Archeology. The Joseph & Feiss Co. 9-11: 1986. Northern Ohio Chapter, Society for Industrial Archeology. Web. 16 Mar. 2014. Article. “Germans Buy Joseph & Feiss.” New York Times 31 Jan. 1989: n. pag. Print. Goldberg, David J. “Scientific Management at Joseph & Feiss.” A Mental Revolution: Scientific Management Since Taylor. Ed. Daniel Nelson. Columbus: Ohio State University Press, 1992. 40-56. Print. Bullard, Stan. 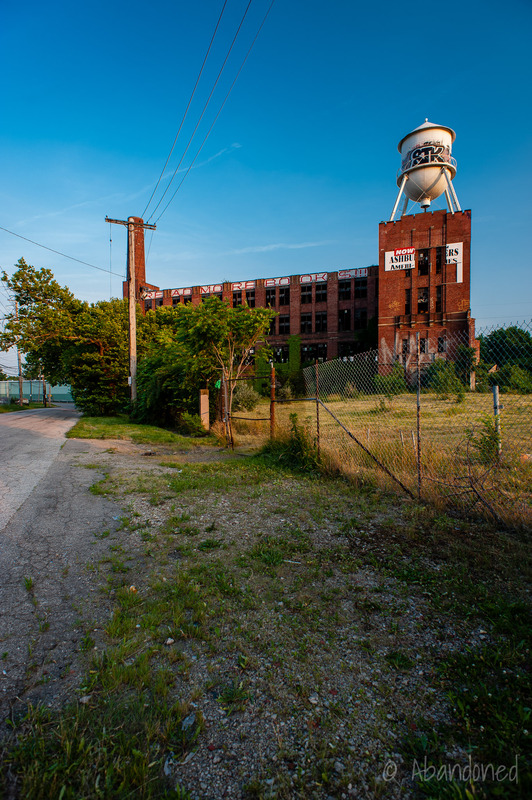 “Ohio Historic Preservation Tax Credit could revive Joseph & Feiss project.” Crain’s Cleveland Business 29 July 2011: n. pag. Web. 17 Mar. 2014. Article. McFee, Michelle Jarboe. “Work resumes at the former Ashbury Towrs housing project on Cleveland’s West Side.” Cleveland.com 14 Feb. 2010: n. pag. Web. 17 Mar. 2014. Article. Bullard, Stan. “Parties work to devise new plan for troubled Ashbury Towers.” Crain’s Cleveland Business 26 Mar. 2007: n. pag. Web. 17 Mar. 2014. Article. Bennett, David. “Townhouse plan back on track.” Crain’s Cleveland Business 16 Sept. 2002: n. pag. Web. 17 Mar. 2014. Article. United States. Dept. of the Interior. The Joseph and Feiss Company Clothcraft Shops. Comp. Julie L. Schutte and John C. Williams. Washington: National Park Service, June 2010. Ohio Historical Society. Web. 17 Mar. 2014. Article. O’Donnell, Patrick. “Old Joseph & Feiss warehouse is now bright new home for Menlo Park Academy gifted charter school.” Plain-Dealer [Cleveland], 23 Sept. 2017. Excellent article! Sad to read of the company’s history and eventual demise, true of so many American companies. My maternal grandfather, Herbert William Howard, moved to Lakewood, OH, in 1910 with his wife Susie Condley Hayes and five daughters, including my mother, Virginia Howard, later Cantlin, to work as a foreman in the men’s clothing department at Joseph & Feiss. Herbert and Susie had three more children while living in Lakewood. Herbert left Joseph & Feiss with another employee to open a business of their own on Broadway in Cleveland about 1919. That business failed because of the larceny of the partner. For a time, my grandfather commuted to Buffalo to work for another clothing company in that city, but he did not like Buffalo, and he apparently did not like that company. He then opened a delicatessen in Lakewood, OH, but that was not something that suited him. He had been working in men’s clothing since his teens, after he immigrated from England to Louisville, KY, in 1887, eventually becoming a designer of men’s clothing. My grandfather moved to Evansville, IN, with his wife five youngest children in September of 1923 for a position as production manager and designer with Buckskin Mfg. Co., another clothier. His wife Susie died in Evansville in 1926. Herbert remarried with Violet Tooley of Evansville in 1930. From Evansville, on to Kansas, Houston, TX, Jacksonville, FL, and finally his last stop and retirement in Metropolitan Atlanta, GA. I liked your article, I’m Mike Evans and I spent 10 yrs working in the Sponging Room as a Decator Operator, your pictures brought back fond memories.